The trend for tech this season is at an all time high from Bluetooth to WiFi it is insanely captivating. What tools of the trade are in your home? Gone are the days of tripping over stereo wires and limiting stereo systems that only allow you to play music in one room. Today’s technology keeps up with your wants for music in every room. Technology has grown so far that you can light up a room and play music, so today’s story goes something like this: Once upon a time, in a neighborhood not so far away from yours, in a red-brick, colonial home, inside a hallway, in a family room, sat a light on a marble table. The table was surrounded by beautiful sound and light, but where was the sound coming from? Traveling to the upstairs, there was more light and more music, yet no wires. Mystifying? In fact not a mystery at all, rather dual use bulbs that provide you a way to light up the room with both music and light. Lavishly live technology out loud, light up the house and rock out with AwoX StriimLIGHT WiFi. These are the most amazing items we have tried to date. AwoX has created “dual use” bulbs for your lights, so it is now possible to light up the house and dance around to your favorite music. The light bulb is allow you to play music from your mobile device(any APP you use to listen to music or on the internet) and light up your home. Additionally, the LED light with Wi-Fi Speaker is also a range extender for your home Wi-Fi. There is not charging a portable speaker, because the speaker is in the light bulb, so this runs on the electricity that runs the light. No longer will you be worrying if you charged a speaker, because there is no charging necessary. 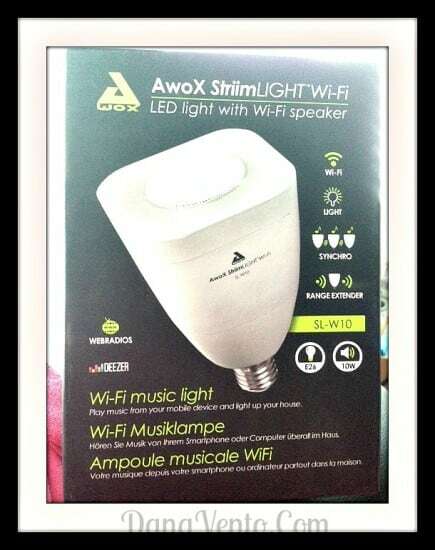 The Wi-Fi speaker in inside of the LED light bulb and your music playing device of choice(tablet, smartphone, etc) will provide your favorite sound anywhere you can plug in a lamp with the AwoX StriimLIGHT Wi-Fi. What formats are supported for the music? MP3, AAC, WAV, PCM, FLAC. If you have several of these AwoX StriimLIGHT WiFi you can synchronize the sound for more intense sounds. The LED light bulb speaker also comes with a remote control that controls the light(on/off/dimming) as well as the sound to pump it up or turn it down. It is very easy to use. The Bulb is an LED, 100-240V, which fits standard E26 light sockets and the speaker offers a 10 Watt, 200Hz-20KHz. Make sure to download the free Awox StriimCONTROL app from the Google Play store or the App Store. Why is this piece of technology so great? If you have a light in the room, it has a light bulb, so why not make the light actually work for you, not just giving off light, but sound as well. This is a fun way to play music from internet stations that you love(ridding the need to purchase CD’s and paid for music) as well as that music you might already have stored. If you have CD’s that you play on your computer, and your computer is Bluetooth enabled you an play your CD’s through it to these speakers and listen to your music in any room! Imagine a room you dine in, suddenly have ambient-appropriate music, wouldn’t that be great for dinner parties, gatherings and every night of the week? Love sports? Tune into your favorite game and listen to your favorite team crush the competition all through an LED light bulb and audio speaker. Lavishly live technology out loud, with no cords or commitments. This is the new lavish way to light up a room with sound and brightness, with the simple implementation of a bulb. This is the perfect gift for any techie on your holiday list that loves music, internet radio, etc and has a light in their living space(kind of everyone right?). There is no charging necessary and all you have to gain s music and light! Product was provided, however, opinions, and images are my own, as I lavishly live technology out loud and share my great new finds with you! Shine on and groove with this find!